This socket is used on your /5 Airhead lower fork caps. It is also used on your /6 and /7 upper spring retainer nuts. 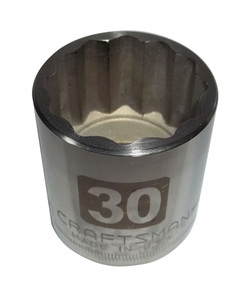 We start with a new, quality Craftsman laser etched socket. We then machine the face to remove the internal taper. This allows the socket to better register / grip the very thin fork caps and prevent rounding / stripping.